Goldfield, Nevada, was one of the West's last mining boomtowns, centered on a fabulously rich gold deposit discovered in 1902 and exhausted by 1920. Goldfield's heyday embraced both the final days of the western frontier and the beginning of the automobile age, and its brief but brilliant history combined elements of both. Distinguished mining historian Sally Zanjani has a personal connection to Goldfield - her father was one of thousands who went there to seek his fortune. In this book, Zanjani tells the colorful history of the town, enhancing her story with the personal accounts of many of its residents. The result is an exceptionally readable narrative of an exceptional place. Goldfield developed first as a rough mining camp after the discovery of gold, but quickly it included modern stamping mills, an array of saloons and brothels, a business district, and a population of widely diverse backgrounds and habits. By 1919 the gold rush was over - the ore bodies were exhausted and most of the population left for greener pastures. A disastrous fire in 1923 destroyed much of what was left. 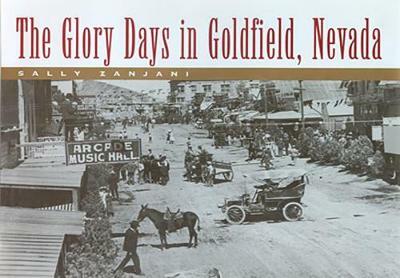 Today's Goldfield is a mere shadow of its halcyon self, but Zanjani's engaging recounting of its story brings this last western gold-rush town to life again as the town celebrates the centennial of its founding. The Glory Days in Goldfield, Nevadafeatures the authentic voices of the gold-rushers themselves, drawn from their letters, reminiscences, and drawings, many never before published. Cheryll Glotfelty, Journal of the West, October 2004"
Goldfield did not beckon long, but, like a roman candle on the Fourth of July, its brilliance dazzled the multitudes. They came, worked, speculated, schemed, played, and eventually left, but what a story between. Well-known western and Nevada historian Sally Zanjani . . . knows Goldfield as well as any person alive, a fact made abundantly clear inThe Glory Days in Goldfield, Nevada. Duane A. Smith, New Mexico Historical Review, Winter 2005"